With his team coming off back-to-back shutout losses, Florida Panthers GM Dale Tallon decided it was time for a shakeup. SUNRISE, FL – Florida Panthers General Manager Dale Tallon announced today that the club has acquired RW Mikael Samuelsson and LW Marco Sturm from the Vancouver Canucks in exchange for RW David Booth, C Steven Reinprecht and Vancouver’s third round pick in the 2013 NHL Entry Draft (previously acquired by Florida in Feb. 2011 along with D Evan Oberg for LW Chris Higgins). 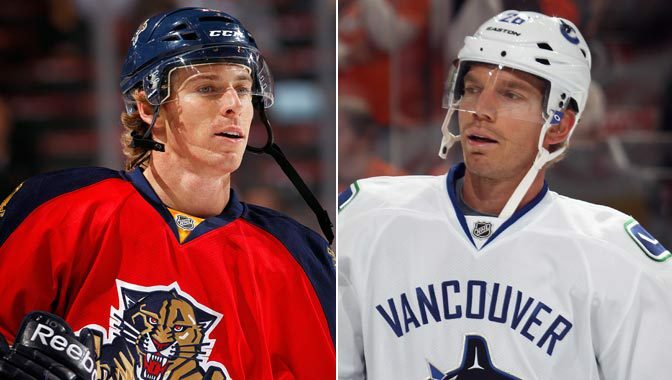 Samuelsson, 34, has played in 621 National Hockey League games for San Jose (2000-01), NY Rangers (2001-03), Pittsburgh (2003), Florida (2003-04), Detroit (2005-10) and Vancouver (2009-11) recording 314 points (135-179-314) and 350 PIM. The 6-foot-1, 220-pound forward has recorded 50 points in each of his last two seasons played, including posting career highs in goals (30) and points (53) during the 2009-10 campaign. Additionally, he has recorded at least 40 points in five out of his last six seasons. The Mariefred, Sweden, native won a Stanley Cup with Detroit in 2008. Samuelsson has appeared in the NHL postseason in each of the last six seasons, playing in 92 contests with Detroit and Vancouver scoring 22 goals with 31 assists. He was selected by San Jose with their seventh choice (145th overall) in the 1998 NHL Entry Draft. Sturm, 33, has played in 896 career NHL games for San Jose (1997-2006), Boston (2006-10), Los Angeles (2010-11), Washington (2011) and Vancouver (2011) scoring 239 goals with 243 assists and 421 PIM. The 6-foot, 195-pound forward has recorded more than 40 points six times throughout his 14-year playing career, including a career best 56 points (27-29-56) in 2007-08. The Dingofling, Germany native has played in 61 playoff games (San Jose & Boston) registering 22 points (9-13-22) and 26 PIM. Sturm was drafted by San Jose with their second choice (21st overall) in the 2003 NHL Entry Draft. Sunrise Sports & Entertainment is the premier company of its kind in South Florida. Follow us on Twitter <http://twitter.com/#!/flapanthers> , Facebook <http://www.facebook.com/FloridaPanthers> and YouTube <http://www.youtube.com/user/FloridaPanthersVideo> . Home to more than 200 events annually and the Florida Panthers hockey club, the Broward County-owned BankAtlantic Center welcomes more than two million guests each year.